Don't forget to vote for my hand painted jewelry in the 2013 RAWards competition. Remember, you can vote once per day through October 9th. Thanks for your support! The newest addition to Watercolor Submarine is the River Critters line. I wanted to pay homage to my home state, so these animals can all be found in and around Nebraska rivers. Each critter is hand cut and painted onto scrap wood (sustainable!) and has it's own story to tell. My particular favorite is Petey the Pallid Sturgeon. Pallid sturgeons are very dinosaur-esque fish. If you get the chance to see one in an aquarium (or in real like if you're extra super lucky) you'll have a hard time taking your eyes off of him! 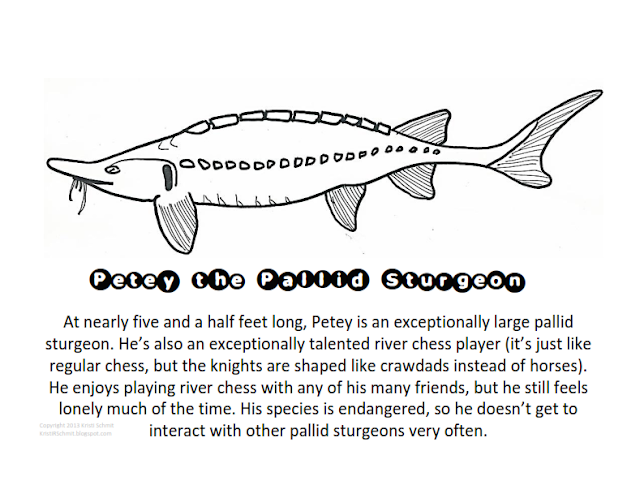 Download and print Petey's story and coloring page by clicking this image!